With the ink of the Revolutionary War Treaty of Paris documents barely dried, the Louisiana Purchase in 1803 took the fledgling American nation from being 13 colonies that stretched to the Mississippi, to a country that encompassed everything from the Atlantic to the Rockies. Not only did the land acquisition of the Louisiana Purchase doubled the small nation’s property, but it proved Thomas Jefferson’s hopes of a farming, agriculturally-led country with a thriving middle class and the dreams of a grand, progressive and democratic society would become a reality. With the end of the Revolutionary War, the newly formed American government acquired the land west of its thirteen original colonies, all the way to the Mississippi river. The borders of the new nation for the remaining directions were as follows: Florida to the South, which was controlled by Spain, the Atlantic ocean to the east, and the Great Lakes and Canadian border to the north. This newly acquired land did not include access to the Gulf Coast, or the city of New Orleans, which was a strategic outpost for the French. For most of the 18th century, Louisiana and its surrounding territories, which were much vaster than the state’s boundaries today (and included land that stretched to through the American Midwest and into Canada), were a major player on the international stage. Controlled by the French, who posted settlements throughout the Mississippi and other large rivers, it was a strategic point due to it’s port and access to the Gulf Coast. With the new nation keen on gaining access to the river and all of the commercial possibilities of trade, the US government was fiercely interested in gaining control of the property. After the French-American War, when France surrendered all of its North American claims, the power was transferred to the Spanish, including New Orleans, and Canada to the British, but Napoleon’s eyes were fixed on regaining France’s presence in the Americas. Though Spain would later become an aggregate to the United States interests (especially in the years that lead up to the Annexation of Texas), it’s presence to the east of the nation was not threatening at the time. In 1795, when the navigation of the Mississippi river was resolved by the two countries, Spain openly granted and allowed access of the river to the United States, as well as the right to store goods at the port at New Orleans with Pinckney’s Treaty, signed on October 27, 1795, that allowed American merchants the right of deposit. Though Spain had retained the right to New Orleans, Jefferson, who was president at the time, felt that the territory would piece by piece come under American control. The United States’ interest in New Orleans were purely economical: the country wanted free transit down the Mississippi and use of the port and the sea thereafter. With gradual settlements by Americans into the area, it was understood that ultimately America would control the very valuable port. However, three years later in 1798, the Spanish revoked Pinckney’s Treaty, ended the American access and usage of the port at New Orleans, upsetting the flow of traffic and commerce for the United States, and boiling into a dispute. It wasn’t until 1801 that Don Juan Manuel de Salcedo, the Spanish Governor, took over from the previous leader, and restored the American access. Though the Americans were once again granted access to the port, the land had come under new ownership: France. Under a secret treaty with Napoleon Bonaparte, known as the Third Treaty of San Ildefonso, Louisiana was officially French territory again, but under the nominal control of the Spanish; all the while, Jefferson’s moves on the area continued. With forty years of control under the Spanish, the control of the Louisiana area did not transfer much to France after the treaty in 1800, until Napoleon sent militia in 1801 to secure New Orleans and place dominance of the area. It was not only a time of unrest for the New Orlean population, with the transfer of power, but for that of the neighboring American Southerners who feared Napoleon would free the slaves of Louisiana, and slave uprisings would cross the borders to plague their states as well. With the post-Revolutionary War America in fear of the European powers asserting influence once again on it’s land through force, Jefferson navigated the political waters with trepidation, eventually sending Robert Livingston to France under the direction to purchase Louisiana after learning of the Third Treaty of San Ildefonso. Further South, France was dealing with many problems, including the re-establishment of slavery in present-day Haiti, where much of France’s wealth was invested in sugar plantations. With Napoleon in power in France, General Charles Leclerc was sent to restore the efficiency and economic dependency of slavery. In attempts to counteract France’s resurgence of power into the America’s, Jefferson halted credit and assistance to the French, and allowed rebels to smuggle contraband through the American neutrality embargo on the Caribbean, ultimately adding the slave uprising and weakening the French foothold in the New World. Later, in November of 1803, France pulled out some seven thousand troops from Haiti after suffering losses of two-thirds of its militia, and gave up on gaining access to the Americas. Haiti became an independent country, and though it became a new republic, the American government refused to recognize it as a free state, fearing slave revolts on American soil. Meanwhile, in the beginning of 1803, Jefferson sent an envoy, James Monroe, a Kentucky landowner and political ally to Jefferson, to join the Minister to France, Robert Livingston, to begin negotiations over the territory. Though Jefferson’s intentions were as small as extending an offering for the eastern half of New Orleans, which would allow American port access, the negotiations provided surprise for the Americans on a much grander scale. With the charge of “securing land, rights, and interest in the Mississippi, and everything eastward of that,” Monroe was granted up to $10 million to purchase New Orleans, or thereby access to the port. With the purse strings and detailed instructions from Jefferson, Monroe set out for Paris. Upon his arrival, Monroe was, however, met with an entirely different offer thanks to Napoleon’s ambitions in the New World losing ground. With the French army embroiled in an inevitable war with Great Britain, as well as a slave uprising of free blacks and slaves in the Dominican Republic and Haiti and a plague of yellow fever among its militia, the French army was greatly diminished, and hurting for more resources, more supplies, and ultimately, more money. The French minister of finance, Francoise de Barbe-Marbois, who was eager to relinquish the ownership of Lousiana in exchange for assets that would grow French interests in the Caribbean and on the Continent, advised Napoleon that Louisiana was a hazardous territory for them to defend, and very likely to drain their resources, or become useless, with all of the other interests of the country. With Barbe-Marbois’ urging—that the abandonment of Louisiana to the United States would bring France a better chance on the world stage—Napoleon agreed to the selling of the territory to the United States, some days before Monroe’s arrival in France. Together, after Monroe landed, Livingston and Monroe took the opportunity and began negotiations immediately for the acquisition. In what Jefferson referred to as “a fugitive occurrence,” the two men reached an agreement that the entire Louisiana territory, including New Orleans, would be purchased for the price of $15 million. Word reached Jefferson of the agreement on July 4, 1803, just 27 years after the nation was founded, that the country’s landholding would double in the biggest territory acquisition of it’s history. Though many viewed the purchase of additional land unconstitutional for the president’s rights, Jefferson’s addition to the country included land that would later become 15 states, and could be argued to be the president’s largest contribution to American history. His move did, however, throw into question the role of a larger federal powers and a possible infringement on states rights, of which Jefferson and his Cabinet debated the authority and boundaries of the Constitution extensively. As a strict Constitutionalist, Jefferson’s political consistency was called into question, and many contemporaries of the time considered the move rash; most believed closer ties with Britain were more favorable than the buying of the Louisiana territory, which more or less declared the US intent to war with Spain. A vote was called to halt the request of the purchase, with Majority Leader John Randolph leading the opposition again Jefferson. Though the house called a vote, it was failed by a margin of two votes, of 59 to 57. Many Federalists continued to resist the bill, by trying to prove that the land was not purchasable from the French because it belonged to Spain, but the effort proved futile. As time for the ratification of the treaty was dwindling, Jefferson opted to push the treaty to the Senate rather than make a constitutional amendment, and the treaty was ratified on October 20 of 1803 with 24-7 vote. Spain’s opposition to the purchase was two fold: first, that France had promised not to transfer the right to the land to a third party, and second, that France had failed to uphold some measures of the Third Treaty of San Ildefonso, which required the European powers to recognize the Spanish monarch the King of Etruria. While the debate sparked some discontent, France made the claim that under the first contest, there was no requirement to uphold the promise that no third party would take control of the land, since it was not promised in the Third Treaty of San Ildefonso, the most recent peace agreement, and second, that the Spanish government had transferred the rights of the Lousiana territories to France despite knowing for months that Britain had no recognized the King of Etruria as legitimate. Spain annoyance at the continued move of American power on their interests, was upset by the move, but unable to provide a military to defend the territory, relinquished control on November 20. Some days later, on December 30, the states took formal possession of the Louisiana Territory. 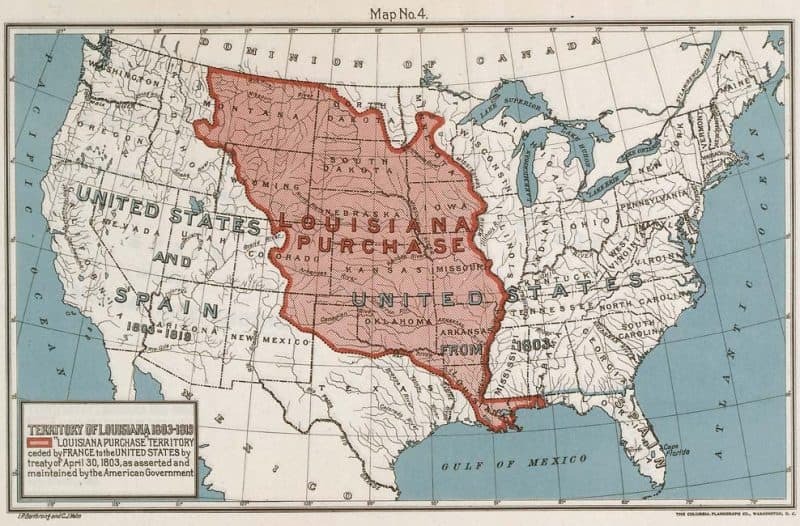 Negotiations continued over the boundaries of the Louisiana Territory over several years, with the US claiming that the territory extended to the Rockies and the Rio Grande to the South, and the Spanish claiming that the territory only extended to the western bank of the Mississippi river. This dispute wasn’t settled until the Adams-Onis treaty of 1819, when the Americans ultimately gained all of the land out west that they had previously claimed. Disputed national lines continued to be a hot topic not just with Spain, but also with France and Britain, though ultimately the Louisiana Purchase doubled the size of the United States and presented unique opportunities to the young nation to continue its westward expansion. These opportunities included the discovery of native flora, fauna, and habitat of the lands stretching westward to the Pacific by Jefferson’s explorers Lewis and Clark, along with discovering manageable paths throughout the west and previously unknown native tribes in the remaining, relatively unclaimed, territories out West. One opportunity was not to be so prosperous for the nation however; slavery. With the new addition of land, the territory was relatively difficult to acquire, hosting a modge-podge of European peoples, mostly of French, Spanish, and Mexican origins, as well as a vast number of enslaved Africans that arrived due to Spain’s continuation in the international slave trade. This population, which was predominantly Catholic, also included a large number of free people of color. Contrasted with a number of slaveholders already residing in Missouri and Arkansas, the homogenous society did not bode well for governance. While the slavery of Native Americans was outlawed in 1836, it would be more than thirty before the Civil War broke out and committed the status of slavery in every state in the union illegal and unconstitutional. The Missouri Compromise was a somewhat immediate solution to the bubbling tension between free and slave states, but the ultimate ramifications of slavery in America would not be decided until half a century later with Lincoln and the Civil War. The History Cooperative is a collective of history buffs, interested authors, and dedicated technical staff who share a love for history. If you would love to help share this love, you can start by filling out a contribution form here.